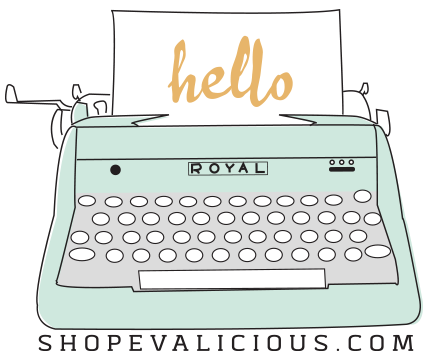 Happy Wednesday, Evalicious fans! Christine here to show you a layout featuring lots of Evalicious stamps! As you know, Eve recently had a shop update and there are SO many new awesome stamps in the shop! I love them all, so I wanted to use a bunch of them on a layout. My layout was inspired by Facebook status updates, or the popular “currently” posts that you’ve seen on blog posts and layouts. I cut up strips of camera patterned paper and notched them so they look like arrows. Then I did the same for white cardstock and stamped various Evalicious stamps on them. I added some circle stamps and used a 1” circle punch to punch them out and adhered them to my layout using dimensional foam adhesive. I also included a camera badge button. I loved this easy way to use lots of stamps in different colored inks on my layout! Have you been getting your scrap on with Evalicious goodies? We would love to see your projects in the Evalicious Flickr pool! You may even win a prize at the end of the month! Have not followed you for long but you seem to be getting more and more crafty.... Sewing?! Great page. Such a fun idea, love the banners and ink splatters! Love this! It is totally awesome and fun.